There’s news about the present plight of Westmoreland in a post by Roger on the Web Forum, RootsChat.com. He writes that Geoff Gransden, who is Project Manager for Westmoreland’s restoration, had hoped to carry out the work at Lower Halstow, her home port for sixty years. After Colin Frake bought her, some immediate repairs were carried out at Standard Quay, Faversham, but she had to move from there. At present she is in a lighter at Otterham. A lottery bid is being made for funding to carry out the restoration. Lower Halstow Parish Council was asked to agree to the restoration of Westmoreland being carried out at the dock. There is apparently considerable public support in the village for Westmoreland to “come home”. At first the Parish Council was split on whether to give permission, but now its members have voted unanimously to refuse, so Westmoreland has no base for her restoration. Posted on 08/04/2012, in Faversham, Lower Halstow, Otterham, sb Westmoreland, Standard Quay and tagged Colin Frake, Faversham, Geoff Gransden, Lower Halstow, Otterham, Standard Quay, Westmoreland. Bookmark the permalink. 2 Comments. How sad it must be for the real stalwart villagers of Lower Halstow, the people who’s descendants and relatives who have helped shape it’s history, to be outnumbered by new neighbours who have little or no regard for it’s heritage. It is extremely dissapointing to hear about a Parish Council rejecting the possibility of saving what was an important link to its recent history. 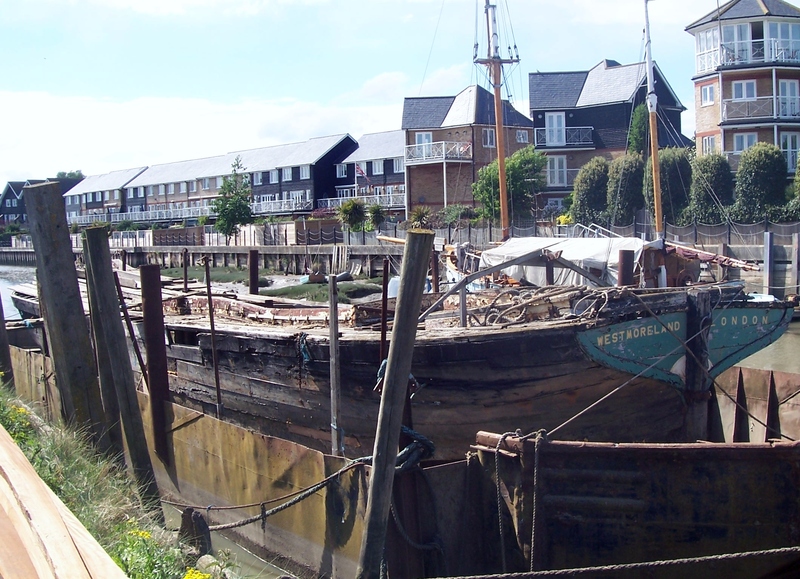 The Thames Sailing Barge Westmoreland had been serving the village of Lower Halstow well before the new housing and the influx of new residents arrived. How ironic it is that a few of the roads these new people now live in are named after the Eastwood sailing barges that once the village was so proud to be associated with. How things have changed, Westmoreland Drive, Cumberland Drive, Lapwing Close,Heron Close and Curlew Avenue would suggest that the village was in touch with its past but sadly it would appear that it is not the case. I sincerely hope that they can be persuaded to change their minds and get behind a project that is so right for Lower Halstow. What a privilege it would be, to see not only the beautifully restored Edith May but also the Westmoreland occupying and sailing out of the dock that was her home for so many years. Thanks for your excellent supporting Comment ,you have expressed my thoughts exactly. Maybe you would be so good and please post it on the Lower Halstow Parish council Message Board . As I think the only historic surname on the Council is Twiss who is obviously well out numbered by newbies. Best Regards Roger.